Anthracene is a solid polycyclic aromatic hydrocarbon (PAH) of formula C14H10, consisting of three fused benzene rings. It is a component of coal tar. Anthracene is used in the production of the red dye alizarin and other dyes. Anthracene is colorless but exhibits a blue (400–500 nm peak) fluorescence under ultraviolet radiation. Coal tar, which contains around 1.5% anthracene, remains a major source of this material. Common impurities are phenanthrene and carbazole. A classic laboratory method for the preparation of anthracene is by cyclodehydration of o-methyl- or o-methylene-substituted diarylketones in the so-called Elbs reaction. The dimer, called dianthracene (or sometimes paranthracene), is connected by a pair of new carbon-carbon bonds, the result of the [4+4] cycloaddition. It reverts to anthracene thermally or with UV irradiation below 300 nm. Substituted anthracene derivatives behave similarly. The reaction is affected by the presence of oxygen. Reduction of anthracene with alkali metals yields the deeply colored radical anion salts M+[anthracene]− (M = Li, Na, K). Hydrogenation gives 9,10-dihydroanthracene, preserving the aromaticity of the two flanking rings. Chemical oxidation occurs readily, giving anthraquinone, C14H8O2 (below), for example using hydrogen peroxide and vanadyl acetylacetonate. Anthracene is converted mainly to anthraquinone, a precursor to dyes. Anthracene, a wide band-gap organic semiconductor is used as a scintillator for detectors of high energy photons, electrons and alpha particles. 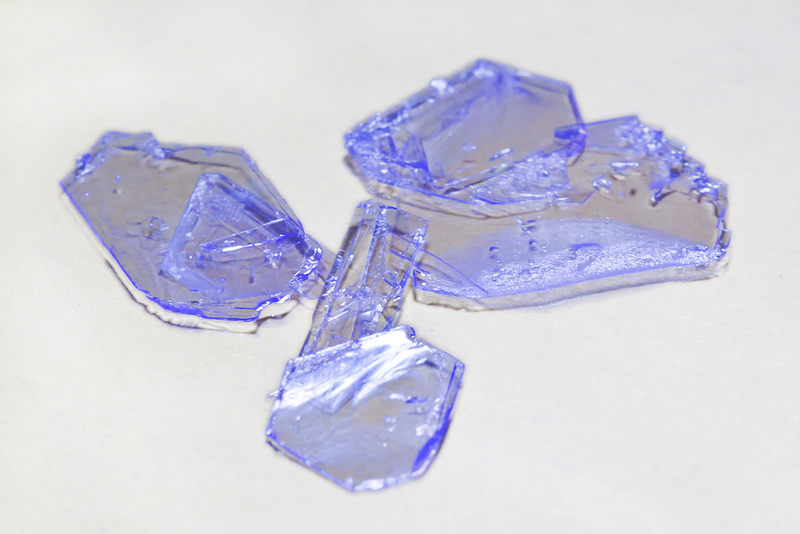 Plastics, such as polyvinyltoluene, can be doped with anthracene to produce a plastic scintillator that is approximately water-equivalent for use in radiation therapy dosimetry. Anthracene's emission spectrum peaks at between 400 nm and 440 nm. It is also used in wood preservatives, insecticides, and coating materials. Anthracene is commonly used as a UV tracer in conformal coatings applied to printed wiring boards. The anthracene tracer allows the conformal coating to be inspected under UV light. A variety of anthracene derivatives find specialized uses. Derivatives having a hydroxyl group are 1-hydroxyanthracene and 2-hydroxyanthracene, homologous to phenol and naphthols, and hydroxyanthracene (also called anthrol, and anthracenol) are pharmacologically active. Anthracene may also be found with multiple hydroxyl groups, as in 9,10-dihydroxyanthracene. Anthracene, as many other polycyclic aromatic hydrocarbons, is generated during combustion processes. Exposure to humans happens mainly through tobacco smoke and ingestion of food contaminated with combustion products. Many investigations indicate that anthracene is noncarcinogenic: "consistently negative findings in numerous in vitro and in vivo genotoxicity tests". Early experiments suggested otherwise because crude samples were contaminated with other polycyclic aromatic compounds. Furthermore, it is readily biodegraded in soil. It is especially susceptible to degradation in the presence of light. ^ a b c d e f Seidell, Atherton; Linke, William F. (1919). Solubilities of Inorganic and Organic Compounds (2nd ed.). New York: D. Van Nostrand Company. p. 81. ^ a b "Properties of Anthracene". www.infotherm.com. Wiley Information Services GmbH. Retrieved 2014-06-22. ^ a b c d Douglas, Bodie E.; Ho, Shih-Ming (2007). Structure and Chemistry of Crystalline Solids. New York: Springer Science+Business Media, Inc. p. 289. ISBN 978-0-387-26147-8. ^ a b c d e Sigma-Aldrich Co., Anthracene. Retrieved on 2014-06-22. ^ "MSDS of Anthracene". www.fishersci.ca. Fisher Scientific. Retrieved 2014-06-22. ^ Lindsey, Jonathan; et al. "Anthracene". PhotochemCAD. Retrieved 20 February 2014. ^ Rickborn, Bruce (1998). "The Retro-Diels-Alder Reaction Part I. C−C Dienophiles". Organic Reactions. pp. 1–393. doi:10.1002/0471264180.or052.01. ISBN 978-0471264187. ^ Bouas-Laurent, Henri; Desvergne, Jean-Pierre; Castellan, Alain; Lapouyade, Rene (2000). "Photodimerization of anthracenes in fluid solution: Structural aspects". Chemical Society Reviews. 29: 43–55. doi:10.1039/a801821i. ^ Charleton, Kimberly D. M.; Prokopchuk, Ernest M. (2011). "Coordination Complexes as Catalysts: The Oxidation of Anthracene by Hydrogen Peroxide in the Presence of VO(acac)2". Journal of Chemical Education. 88 (8): 1155–1157. Bibcode:2011JChEd..88.1155C. doi:10.1021/ed100843a. ^ Zeitler, Alex (2012-06-27) Conformal Coating 101: General Overview, Process Development, and Control Methods. BTW, Inc.
Wikimedia Commons has media related to Anthracene. Wikisource has the text of the 1879 American Cyclopædia article Anthracene. "Anthracene" . Encyclopædia Britannica (11th ed.). 1911.